Scent: Smell of citrus; definitely lemongrass. Taste: Not very sweet; the carbonic acid comes through very clearly. Tastes a bit like club soda but sweeter, with grassy notes. Tastes more like lawn than the Dandelion and Burdock did, but not like thick weedy lawn. It's more of a new-grass lawn, rather than old overgrown lawn. 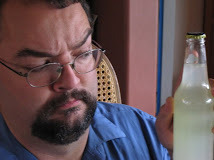 The lemongrass is very clear; it's like drinking a cold liquid Thai spring roll. Not much aftertaste, what there is is faintly lemony, with a touch of bitter. This is sweetened with cane sugar, and not much of that.